A savory, hearty short ribs recipe completed with veggies and a delicious gravy! (Prepare in a crockpot, stovetop, or oven). 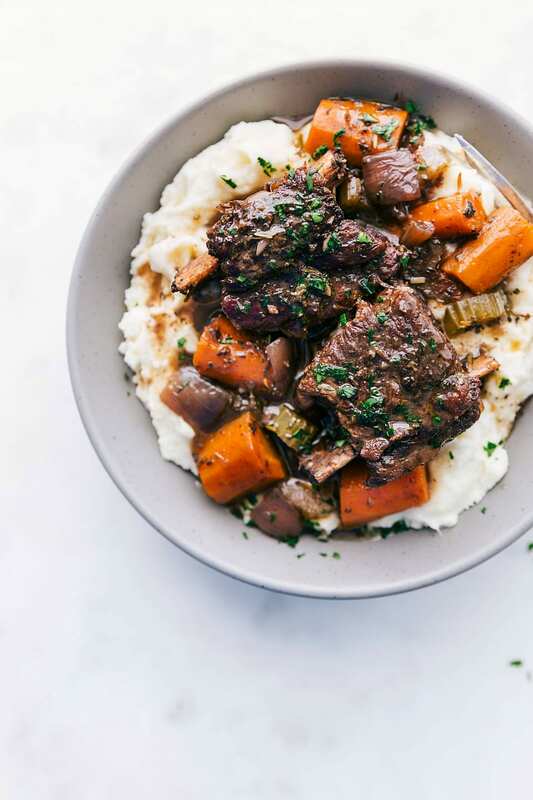 Serve these amazing short ribs with mashed potatoes, this Italian salad, and/or some homemade rolls. My sister went to the grocery store the other day to pick up some bone-in short ribs for me. However, instead of getting short ribs, she came back with bone-in rib-eye steaks 🙂 At least it was still beef, right? What does a short rib look like? As you can see in the picture below, bone-in beef short ribs come in large chunks with the bone still attached. When picking out your beef look for good marbling in the fat for the best flavor. You also want to make sure the ribs are bone-in which helps conduct heat within the meat to ensure it cooks more evenly. Beef short ribs are the equivalent of pork spare ribs. Beef ribs are generally a bit larger and more “meaty” than pork spare ribs. Both are delicious in my opinion! 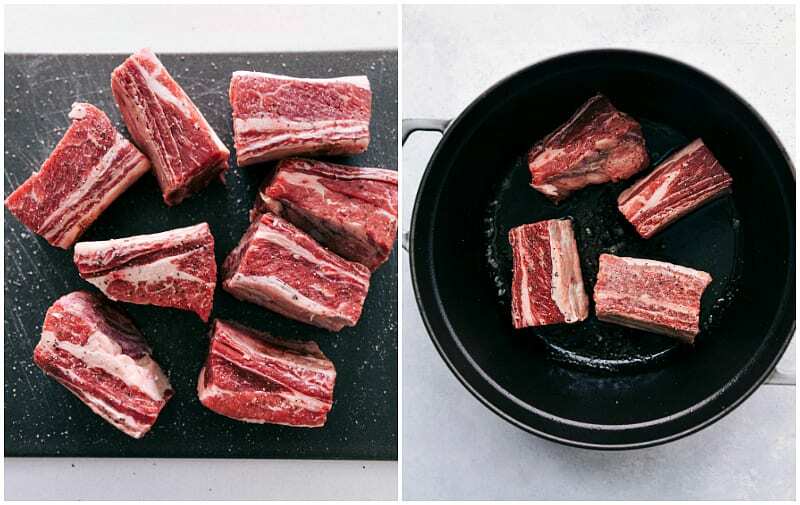 What is the best way to cook beef short ribs? The best way to cook beef short ribs is in a slow cooker. 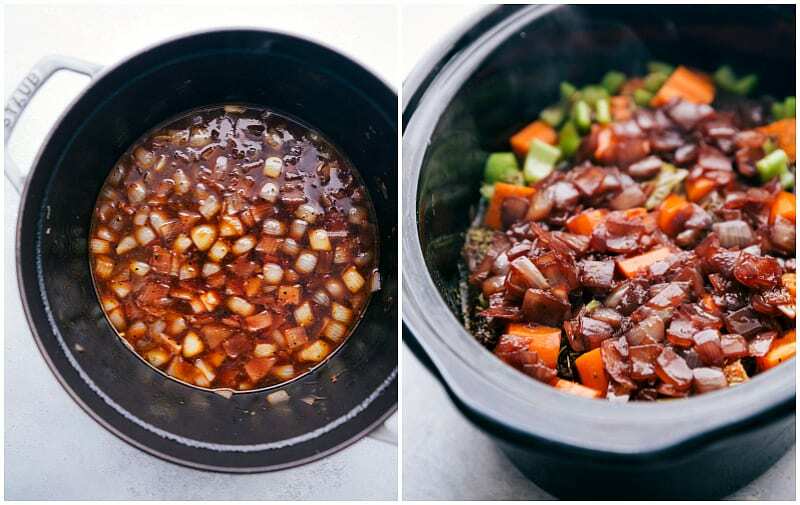 The slow cooker gets them super tender and its nearly impossible to mess up! While you can certainly cook them in other ways, it’s easier to dry them out while using other methods. Before putting the short ribs into a slow cooker I’d recommend that you quickly sear them. 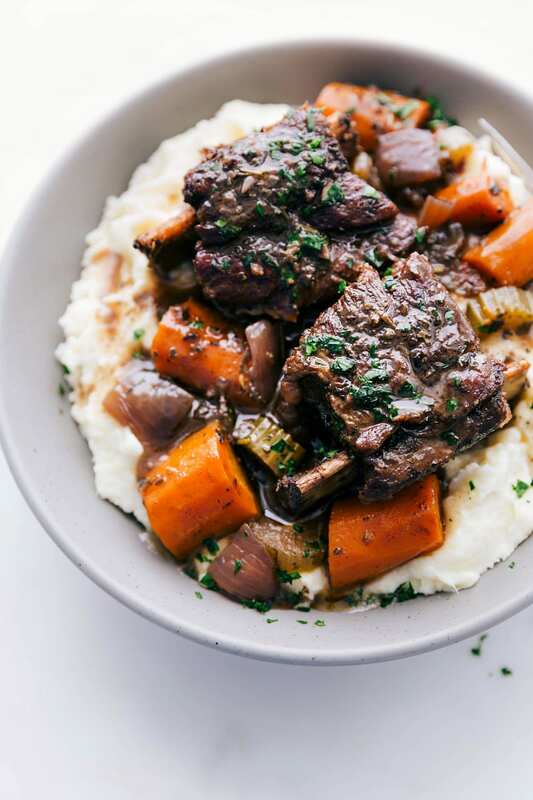 This will caramelize the surface of the meat which will really enhance the flavor of the dish – braised short ribs cooked in the slow cooker can’t be beat! How do you cook short ribs in the oven? Remove the ribs to a plate and then drain off all but 2 tablespoons of the fat. 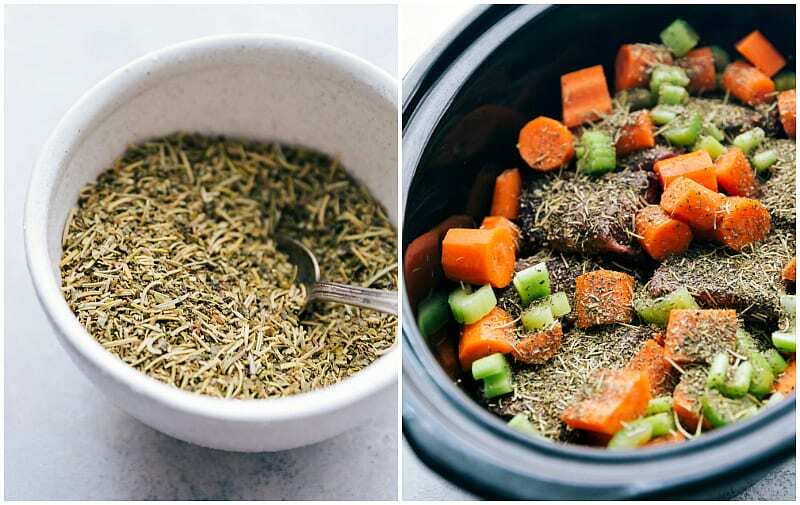 Add the carrots, onion, celery, and Tuscan seasoning to a large oven-safe dutch oven and stir for 5-6 minutes over medium-high heat on the stove. Add in the garlic, Worcestershire sauce, tomato paste, bay leaves, beef broth, and 1 cup of juice. Stir. Return and submerge the short ribs in the pot. Put a lid on the pot/dutch oven and transfer to the oven (325 degrees F.) Cook until the meat is fork-tender and falling off the bone, about 2 to 2 1/2 hours (flip the meat around after 50 minutes). Remove the pan from the oven and allow to sit for 20 minutes with the lid on before serving. Skim the fat off the top of the liquid and follow recipe directions to prepare the gravy. How do I skim the fat? 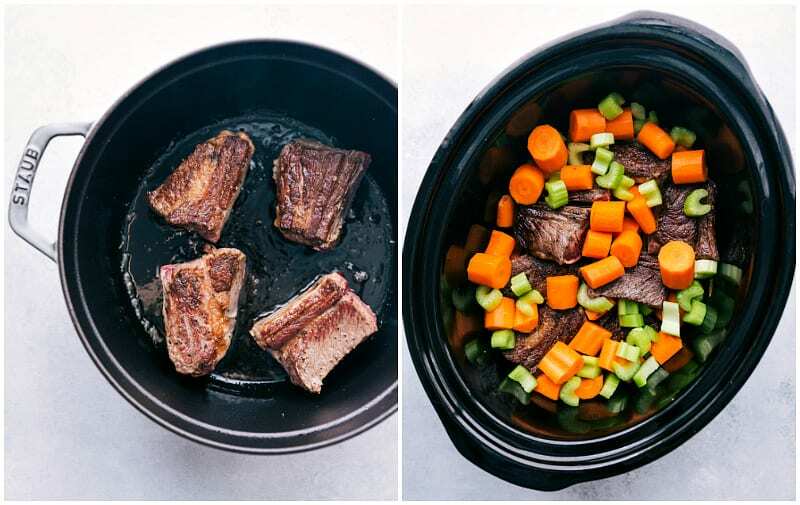 Once the beef is done cooking, removing the beef and vegetables from the slow cooker/ dutch oven and place the cooking juices in a small saucepan. Let it sit for several minutes so the fat can float to the top. Gently tilt the pan and with a spoon, skim off all the fat that risen to the top. For a more detailed description on how to skim the fat, you can check out this post. This recipe became an instant family favorite in my house. I hope you enjoy it as much as we do! 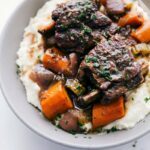 A savory, hearty meal of short ribs with veggies and a delicious gravy! Made this last night and wow! My SO and I loved them He commented on the flavors, liked the combination of herbs. I did make them in the oven however, as I’m not a huge crockpot fan. I would add a couple extra carrots next time – they were particularly yummy.